Maybe you saw this last week (sorry for the dupe), maybe not: Here’s a recipe I made up for Warm Radish Salad with Anchovy Butter, Farro, & Roasted Almonds. We return to a forecast that finally looks like spring — or is it summer? Either way, sometimes when the weather turns like this, I get impatient for all the spring — and even summer — treats to be ready already! But the reality, of course, is that it’s only now that the weather is turning that those things are really starting to grow. I try to remind myself that there is a bounty coming — and soon — but I shouldn’t overlook some of the less glamorous items that are creeping in. The above recipe for a radish and grain salad was inspired by that effort — to really celebrate what we have right now, to showcase the highlight of each micro season as this miracle season progresses. Our other big celebration this past week was of dill — simple butter sauteed shrimp tossed with linguine, a splash of white wine, a splash of cream, and a shower of dill. Nothing complicated, just elegant — and really highlighting the incredible flavor of fresh spring dill. The other miracle this week, at least for me, is spring garlic — the garlic version of scallions — which is scheduled to arrive mid-day Friday. I love that this happens just after the last of the fall garlic is gone, though I have to remind myself that it’s not entirely a coincidence. The fall garlic, stored carefully since harvest, simply wouldn’t store anymore, because it was so intent on sprouting. It’s time! The planted garlic in the field also knows it’s time to sprout, and so the very phenomenon that takes away the last of the storage crop also brings us the first flush of fresh garlic. It’s a beautiful thing. 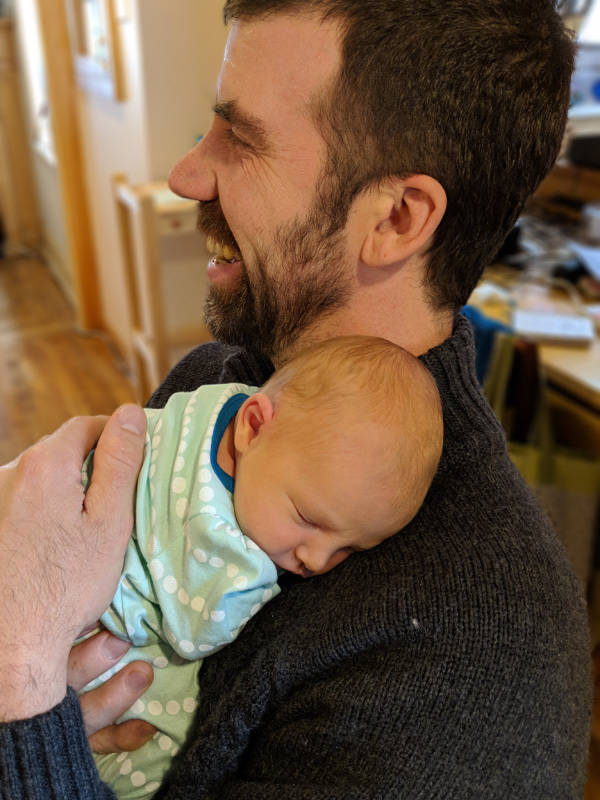 Perhaps I’m overly intoxicated with the joy of new babies, fresh veggies, and the promise of sunshine and warmth in the forecast….but really, what’s wrong with that?